If you plan on making handmade greeting cards to give to your family and friends, make sure you give some thought to how you'll score your paper before folding it. The heavy paper often used in card making may crack if you fold it unscored. Thankfully, there are numerous techniques available for scoring, whether you plan on making one card or hundreds. Ultimately the technique you choose is a matter of personal preference. If you plan on making only a few cards, scoring your paper with items you find around the house may be a better choice than investing in equipment. If you plan on making multiple cards, however, you may want to invest in some special scoring tools. A butter knife and a ruler are technically all you need to make an even score mark in your paper. This technique works best for light-weight cardstock, but can be used for heavier cardstock if need be. Set your cardstock down on a flat surface. Place your ruler down where you want to make the score. Take the time to line up your ruler carefully so you get an even, straight line. Hold your butter knife with the serrated side facing up. 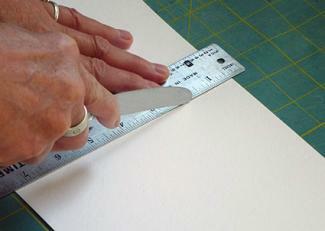 Press the non-serrated edge of the butter knife on the cardstock right up against the ruler. Press down very firmly on the cardstock and pull the knife down the ruler, keeping even pressure on the paper the entire time. Repeat for heavier papers to get a deeper score. 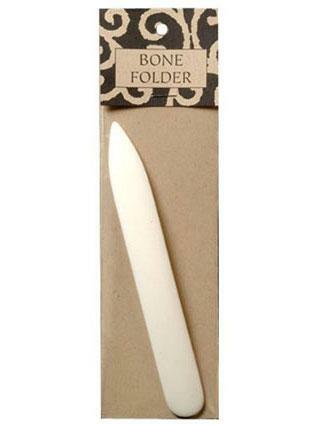 Bone folders are available at your local craft store, generally located in the paper crafting section near the card making supplies. They are used with a ruler, similar to the butter knife method, to get a clean score. The smooth edge of the bone folder makes it ideal for specialty papers, while the fact that it has a thin end and a thick end means you can adjust the size of the score to the weight of the paper. Place the cardstock down on a flat surface. Set the ruler down on the cardstock where you want to make the score. Hold the bone folder so the thin, flat edge is pressed up against the ruler on the cardstock for thinner papers and the thicker end is pressed up against the ruler for heavier papers. Press down firmly with the bone folder on the cardstock and drag it down the ruler to score the paper. Repeat for heavier papers. If you have a rotary-style paper trimmer, you may want to invest in a scoring blade that will allow you to score multiple sheets of paper quickly. This is ideal if you make a lot of cards because you can quickly line up a sheet of paper on the trimmer and score it without worrying about crooked lines. 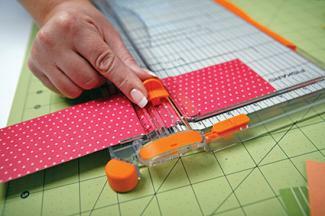 Unscrew and remove the current blade on your paper trimmer. Replace it with a scoring blade and tighten it into place. Slide the blade to one end of the trimmer. Place the paper on the tray and line it up on the grid where you want to make the score. Push the blade across the paper to score, then remove the paper. Hand held rotary cutters also have optional scoring blades that you can change out to make a fast, clean score. Some rotary tools also come with a dedicated scoring blade so you can keep a tool ready for scoring at all times. Both options work the same way. This method is good for card makers and crafters that make cards fairly regularly, but don't necessarily make them in large quantities. Set your paper down on a flat surface. Place a ruler down on the paper where you want to make the score. 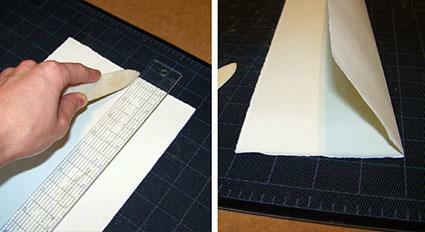 Set the blade of the scoring tool on the paper directly next to the ruler. Some rotary tools may need you to press down firmly to release the blade from the safety. If this is the case, turn the tool so that the blade will touch the ruler as well as the paper when it extends to get the closest score. Press down firmly on the tool as you pull it down on the ruler to score the paper. Thicker papers should have a wider score. If your paper is correctly scored and folded, there will be a "ridge" created by the scoring element on the inside of the card. This helps to minimize the stretch of the paper fibers. Paper is more difficult to fold when it's very humid. Ideally, the ambient relative humidity in your work area should be roughly 50%. When you are folding your cardstock, try to make the final fold parallel to the grain. Once you know how to score your paper, you'll get a perfect, crack-free crease in your cards every time. Start scoring your cardstock and paper before folding and help give all of your cards a professional look.